We just unveiled our top picks for the Best Cooling Mattresses on the market and our celebrating with giveaways inspired by our selections. We’ve got contests for Purple and Ghostbed live on the site and our adding a third to the mix from Loom & Leaf! Loom & Leaf Mattress Giveaway! The Loom & Leaf is an ultra-plush mattress built with a thick top section of pressure-relieving memory foam. While this material has a bit of a reputation for overheating, Loom & Leaf has outfitted its top layer with a cooling gel infusion guaranteed to keep temperatures pleasantly chill all night long. I like both the Zenhaven and the Purple mattresses because I’m a side sleeper but this one sound very good too. Its just too hard to choose one. I have two favorites – the Zenhaven or the GhostBed Luxe! I think the Zenhaven would be my favorite, but Loom and Leaf looks great too! Would love a new mattress that keeps me cool! I would have to say the Purple.. This mattress sounds great, I also like the I like the Dream Cloud, it seems to be the better mattress for side sleepers. My favorite is whichever one I can win. Very old bed. Loom and Leaf looks to be one of the best mattresses and reviews. I think I could get some great sleep onThe Loom &Leaf mattress. Between the layers of memory foam and cooling gel, that should help night sweats. A mattress that could easily allow me a restful sleep-hope I win! All of the mattresses have great points. I really like the Purple one. You had me at Plush and Cooling Gel Infusion Layer! After reading a bit more and taking some of your tests… I’m thinking the #ZENHAVEN may be the best latex mattress for me! Thanks for doing all these Giveaways. I’m disabled and sleeping on a couch is causing me more problems than not. But it’s better than a 30+ yr old, half devoured (puppy) mattress. Poor hubby can deal with that solo! I’m going to keep entering and keep trying! Fingers crossed! My mattress squeaks every time I move and it has collapsed in the middle. I could finally get a good nights sleep! My favorite is the Allswell mattress. y husband could use anything else to sleep pn! Because I would like to sleep cool and it is made entirely with all-natural materials, my choice is still Zenhaven. This is another great mattress.There are so many to try to choose just one is hard. Would love to win this for me and my fiance! Would make a great wedding gift. Thank you for the reviews. I believe I could be happy with this mattress. All of them are great but my favorite is the Purple! Would you please break my unlucky streak and draw my name. Your mattress is awesome and I would love to win it. my back would love it after I have had back operation in 2003 this foam mattress I have not working . This looks amazingly comfy. Would love a good nights sleep. thanks for an opportunity at this giveaway!!! Zenhaven is my favorite latex mattress! I’m a side sleeper. The reviews for Zenhaven say this should be my choice. But Idle hybrid is the one. Beds are for more than just sleeping and coils help with that overall balance. I would love to have the latex cooling. That would be wonderful. I really like the Zenhaven but they are ALL nice!! I sure would like to win this mattress. The one I’m sleeping now has a spring that finds my lower back, no matter which way I turn. pls pick me. I so need a new mattress. Thanks for the super chance. I am always hot-desperately need a cool mattress. I think my favorite latex cooling mattress is Wink bed so far thanks for the great list. The Ghostbed is my favorite! I think the Zenhaven would work best for me. It would be soooo comfy to win! This totally describes me! I am always too hot at night – no matter how cold it is outside. I would love the cooling mattress for a better night sleep for me. Thanks for the chance to win. I also like the zenhaven latex mattress. I like when he said organic he took my heart away! I am going mattress shopping! The Loom & Leaf cooling mattress is awesome! Thanks for the opportunity to win. I’d love a little chill on a warm night. I love the Purple Mattress! Thanks! We would like a quality mattress and Sleepolis would fit the bill. Honestly any would be awesome but the Ghost Bed looks amazing! The fact that Loom & Leaf mattresses is a cooling mattress and that organic cover is used, I like theses facts. I would love to have a new mattress to sleep on !!!!!!!!!! The Layla is my favorite, but the Purple mattress is a close second. THE INFO I NEEDED TO MAKE AN INFORMED SELECTION OF MY NEXT MATTRESS. THANK YOU SO MUCH. Loom and Leaf top of the line beds would love to win. I think you do great on all reviews. They are always so detailed and love the videos. The Nest Hybrid Latex mattress. Your vids comparing mattresses are very helpful, there are a LOT on the market these days. This one looks super comfy…and cool, thankfully. Thank you for offering this mattress as a giveaway! The gel memory foam sounds interesting! I’m at a crossroads between several choices….the Loom and Leaf being second, the Ghostbed Luxe first, and the Purple 3rd…I wish I could TRY all of them!! Love the Loom & Leaf mattress, read many good things and I’ve been mattress shopping. I like the features of this mattress. I love that The Loom & Leaf mattress comes built with a thick top of memory foam. Even better it comes it a cooling gel infusion! This would be amazing especially since I don’t have a mattress. My mother recently bought a loom & leaf mattress. She has repeatedly exclaimed how much she loves her new mattress. I haven’t tried it, but considering she can be tough to please, I know it must be great. Loom and Leaf has been high on our list of mattresses to consider. I like the Purple Mattress pretty well. Looks comfy. Lets get the win and sleep good like the sweep gods! I think WinkBeds is my favorite! Sounds awesome. I do manual labor every day and the memory foam pressure relief would be great for me. Thanks for the chance! Hope I win for my husband! The Loom and Leaf is one of my favorites. Supportive Memory Foam on top of a quality mattress makes all the difference in the world when it comes to a good night’s sleep! Thank you for the detailed and informative information! I like the Loom & Leaf, Purple and Layla. So many great mattresses! Either the Purple for Layla sounds great for me. I’m a hot sleeper so this sounds fantastic! Thanks for the winning opportunity! In desperate need of a new mattress! I think the best for me would be the Relaxed Firm. Would love to win the Loom & Leaf Mattress giveaway! I love the idea of a cooling mattress and would definitely get a better night sleep. It’s my dream mattress!! The ZenHaven sounds like the best fit for me! This would be amazing to win! my husband and i both have back issues and we both feel that a Sleepopolis mattress would help us sleep and feel better! thank you for the opportunity to win and incredible mattress! My favorite latex mattress you’ve reviewed is the Idle. Would love to try the Loom & Leaf mattress, read many good things the past 2 years I’ve been mattress shopping. At first I thought the Purple mattress would be best for me but after reading reviews on Loom & Leaf I have changed my mind. Mainly because I am looking for the best mattress that will give me relief from my pressure points. I have chronic pain and have been sleeping on a hard mattress way too long. And having a mattress that helps keep me cool is another plus for me. The loom and leaf is my favorite because it looks like it would be a rich person mattress with that add silk trim. I am a senior and I like how it helps cool you and the memory foam will not hurt the old bones!! I’ve been looking for a great organic mattress. It would be cool to win this one! Thank you SO much for the opportunity.. My husband has neck issues and this would be a godsend for him. I sleep so hot! Need cool mattress! Looks nice! I sure could use one! Its really hard to decide which I like best! I’m thinking maybe the Layla since it’s good for side sleepers which is me. I also like this one since it’s memory foam but also helps with cooling. I love the cooling mattress because I can’t sleep when it’s too warm! Would love to win a new mattress for our daughter! My pick for best latex mattress would be the Zenhaven. I am sure I would love this mattress!!!!! For those that sleep hot, this is a great mattress for you!! The Loom & Leaf is an ultra-plush mattress built with a thick top section of pressure-relieving memory foam. While this material has a bit of a reputation for overheating, Loom & Leaf has outfitted its top layer with a cooling gel infusion guaranteed to keep temperatures pleasantly chill all night long. You always come out with a better mattress. I love this Loom & Leaf because i need to be cool when I sleep. I wake up soaked without bed now and sleep with the window open all year around. I would luv to win I have tried and tried every way u can possibly imagine, my doctor tried thru my insurance with a script, I signed up for the last year and a half thru every giveaway, and I’m at a point where I have not slept in a bed in almost 2 years. Thank u for all the chances just think I’m at a point where just never going to win, or afford a bed or ever sleep in one again. I’ve heard a lot of good about Loom & Leaf! This would be a huge upgrade for us! I find these reviews very helpful. As a side-sleeper, and an aging adult having a good sleep is sometimes a bit challenging. Choosing the right mattress is essential. 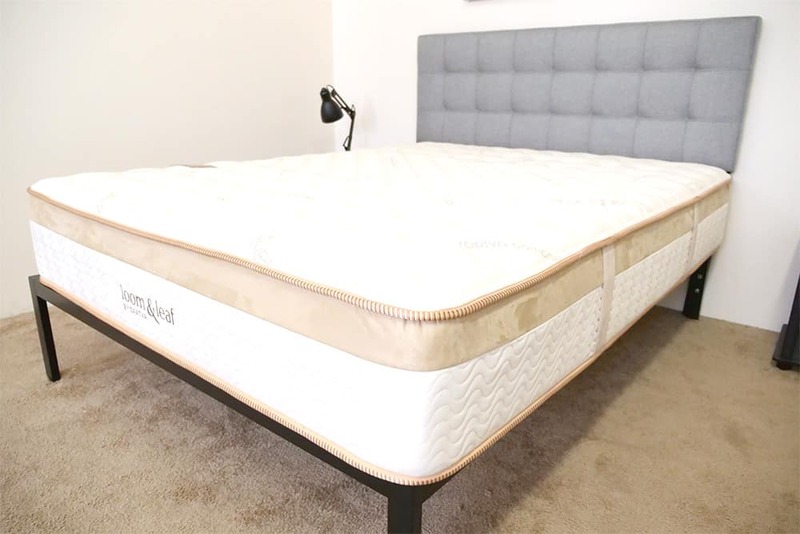 Sleepopolis gives a very “hands on” review which should be viewed by anyone buying a new mattress – so they can find the best value for their needs and budget. Also, the coupons are an added value! Since the question is about the Latex ones, I would have to say the Idle hybrid or the Avocado green seem like a good fit for me. This is a great mattress. I would love to win one and enjoy better sleep – something you can’t even begin to put a price on. What can I say? My mattress didn’t EXACTLY come over with C. Columbus but close enough as makes no never-mind. Out of the latex mattresses you’ve reviewed, I am most intrigued by Zenhaven and Spindle.